How to use Mendeley and Docear at the same time? Mendeley has a feature to create and update a BibTeX file that can be used with Docear. To activate this function in Mendeley, select “Tools -> Options -> BibTeX” and ensure all settings are as in the screenshot. The Path is not fundamentally important but ideally it should be within the project home of Docear. 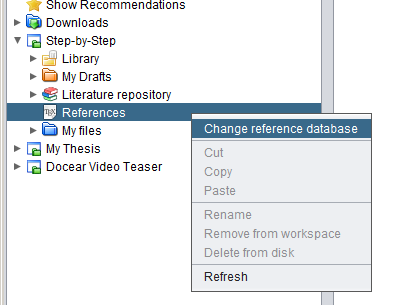 To tell Docear where your Mendeley-BibTeX file is stored, do a right click in the workspace panel on the “References” database and chose “Change reference database”. 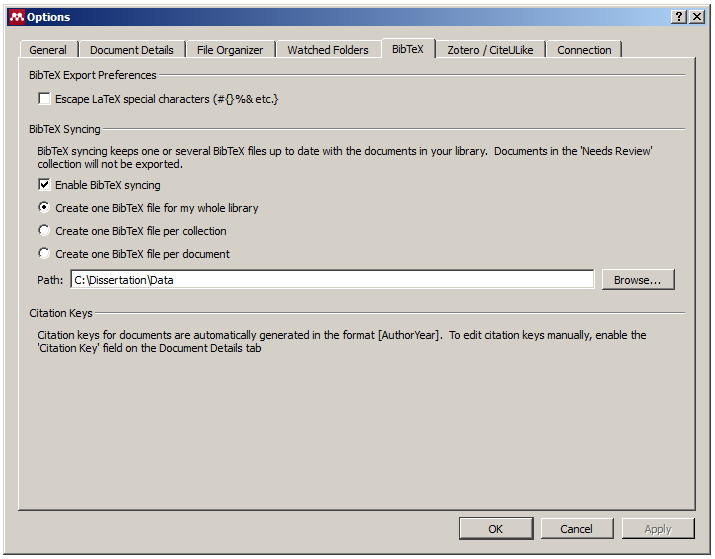 Then select your Mendeley BibTeX file (it is called library.bib and it is stored in the path you specified above). Important: Do any changes on your reference data directly in Mendeley. Do not change reference data in Docear because all changes made in Docear will be overwritten by Mendeley. If you like, visit the Mendeley support forum and vote on the idea that Mendeley synchronizes BibTeX data in both directions. along with a comment what went wrong and we will try to find the error and fix it for you. Also, Mendeley does not include entries set to “Details need review”. Please vote here to have Mendeley include all entries in their BibTeX export. We highly recommend to deactivate the functions “Sort files into subfolders” and “rename document files” because otherwise problems might occur in Docear when files are automatically renamed by Mendeley (Docear won’t find them when Mendeley renames them). If you have activated the function “Organize my files” in Mendeley, it is important to specify the directory that you specified in Mendeley also as your literature repository in Docear. Only then, Docear and Mendeley can work with the same PDF files. 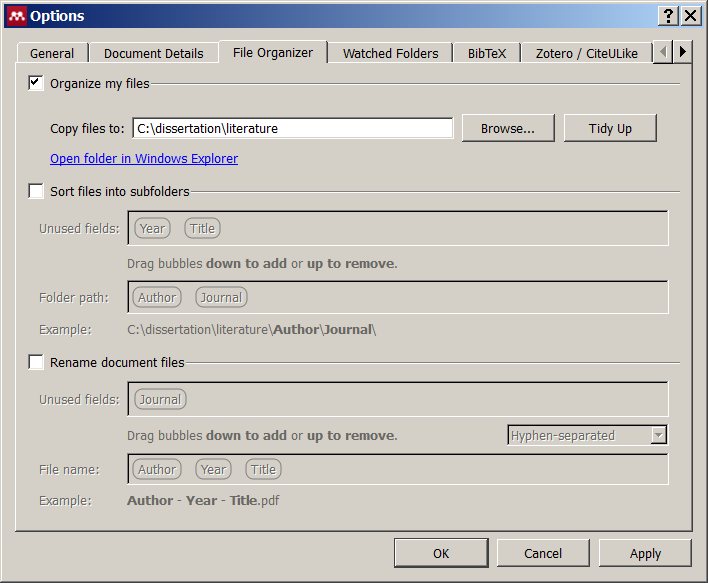 To do so, do a right click on “literature repository” in the workspace panel and select “Add Literature repository”. Select the same directory you have specified in Mendeley. If you do not have activated the function “Organize my files” in Mendeley, you need add the folder you are watching in Mendeley as literature repository in Docear. You find this folder in Mendeley in the Options in the tab “Watched Folders”. Finally, you should be aware that Mendeley is not using the standard PDF format for storing annotations in PDFs. This means, when you create annotations in Mendeley, Docear cannot access them (nor can any other normal PDF editor). Therefore, we strongly suggest that you create and manage your annotations only with Docear and your favorite PDF viewer but not with Mendeley.